Simon Wilder talks us through the book that sheds light on what's in the fridges of Europe's best chefs — from frozen flies to fois gras. 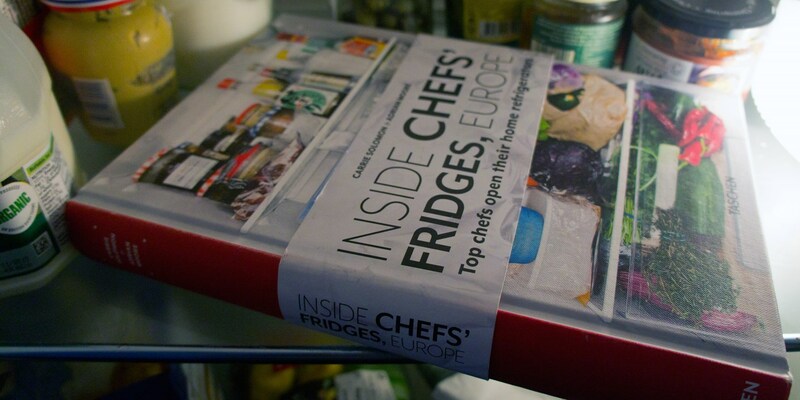 If you’ve ever wondered what chefs keep in their fridges you now have an answer in Carrie Solomon and Adrian Moore’s handsome new book, Inside Chefs’ Fridges, Europe. The title of the book does not mislead; it features the fridges and their contents of forty chefs from around the continent. Each chef is given his or her own chapter and there are recipes, which are, I guess, useful, but they’re hardly the point. What we want is an insight into the cooking of these chefs through what they keep at home. We hope that it will be like looking inside their heads. Food fashions being what they are, there’s a perhaps unsurprising continuity in the contents of these fridges; the esoterica of pickles and ferments, japanese vinegars, sriracha, Heinz ketchup. Indeed, Inaki Aizpitarte of Le Chateaubriand in Paris has an entire collection of hot sauce. He also uses his fridge for food experiments and only cleans it when they begin to rot. I can sympathise with that. Akrame Benallal, of Akrame in Paris, has one of the best stocked fridges (as well as one of the worst shirts). He talks about what he eats at home and how it differs from what he serves in his restaurant, despite cooking more or less the same in both places. One of his family’s favourite dishes is an Algerian milk soup with angel hair pasta. The version he serves in his restaurant has pasta that is hand cut, aged Parmesan and white Alba truffles grated over it. The version he serves at home does not. I’m sorry he doesn’t give a recipe for either version. You might begin to think that, in the way hairdressers have the worst hairdos, chefs have the worst diets. This is true to an extent; they grab mouthfuls of this and that as they work. Many of these chefs say they almost never cook at home, which may explain why so many of their fridges don’t appear to contain the ingredients for a meal. Maybe they’re more resourceful than we are when cooking dinner. Several keep tomatoes cold, something others tell us ruins their texture and flavour. Odder still is seeing honey on a shelf: there’s no need to refrigerate honey; it has been found edible after being disinterred from the tombs of pharaohs. I didn’t expect to see whole salamis, either, or, most peculiarly, unopened tins of mackerel. Perhaps they were put there by a stylist. We learn many things about the lives of chefs: Rasmus Kofoed of Geranium, in Copenhagen, keeps flies, suspended in ice cubes, in his freezer. I was pleased to be told they’re for his fish tank. It’s quite a pleasure to poke around in strangers’ fridges. One contains ‘unknown condiments left by ex girlfriends’, which hints at a chef’s lifestyle perhaps as well as ‘gift from Thomas Keller’ or ‘organic home-made baby food’. In fact we learn many things about the lives of chefs: Rasmus Kofoed of Geranium, in Copenhagen, keeps flies, suspended in ice cubes, in his freezer. I was pleased to be told they’re for his fish tank. Grégory Marchand, of Frenchie in Paris, enjoys an English breakfast above all other meals and La Vache Qui Rit (Laughing Cow) above all other cheese: ‘I can’t get enough of it, it’s like crack to me.’ David Munoz of Diverxo in Madrid knew that he wanted, from the age of six, to eat foie gras every day. For many years after that’s what he was given for his birthday present. Sébastien Bras, of Le Suquet in Laguiole, keeps vacuum-packed gyromitre mushrooms which are ‘slightly poisonous if improperly cooked’. 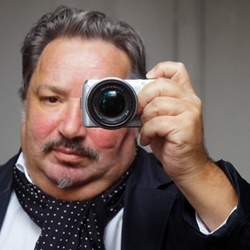 We learn that Pierre Hermé uses flan powder (a sort of Spanish custard powder) in his pastry cream which is an idea I can’t wait to try and that Joan Roca, of El Celler de Can Roca in Girona, uses black olive tapenade in his vinaigrette, which may turn out to be a top tip. All the photography by Carrie Solomon is excellent; the portraits of each chef against bleached out backgrounds are beautiful. I would love to see them hanging on a wall together. The chefs all look healthy, tanned and handsome, unlike the scrawny, pale specimens chefs usually are, working eighteen hour days, never seeing sunlight. Of course, Magnus Nilsson, of Fäviken in Sweden, doesn’t have a fridge. He prefers his root cellar, where he keeps many pickles and ferments of food that have been foraged from the ancient and isolated forests and butter that has, of course, been hand-churned. Indeed, the most recherché items in the book are found in Mr Nilsson’s root cellar: pickled marigold flowers, fermented lupin bean paste, crowberries, birch sap syrup, pine mushrooms in oil, and a drink made from juniper berries that isn’t gin. I checked, and none of these items can be found at my nearest Waitrose. Finally, in an act of defiant, British, bloody-minded one-upmanship, it is hard to beat Marco Pierre White’s fridge. His vintage Frigeco icebox was found, abandoned, on a French riverbed and was restored and modernised at some cost. It is metal-lined, perhaps in case of nuclear attack. Mr White says it ‘is an object of great beauty, but nowadays they are more form than function’. It is, of course, utterly empty. Mr White prefers not to cook at all when he’s staying in the country.